About 60% of the new S4C building should be occupied by next September with announcements over tenants set to be made in the new year. MPs were told in March it needed at least that percentage to break even. It is hoped Yr Egin - the new Carmarthen headquarters of the Welsh language broadcaster - will become a creative and digital hub. The Welsh government is contributing £3m towards the cost, with another £3m coming from the Swansea Bay city deal. 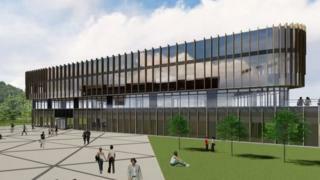 It is being built by University of Wales Trinity St David. Associate Pro Vice Chancellor, Gwilym Dyfri Jones said the project was "on time and on budget" and should be completed by July, with an official opening at the end of summer. He said announcements over tenants will be made over the coming months with, it is hoped, 60% of the building occupied when it opens. The university predicted Yr Egin would create 100 new jobs with a further 50 to 55 coming with the relocation of S4C from Cardiff. Meanwhile, the broadcaster will develop a new digital channel over the next 18 months, its new chief executive Owen Evans said. He told assembly members that S4C needs to change and the new offering will be be similar to BBC3 - launched in 2003 to provide "innovative" programmes for 16 to 34-year-olds.